From My House : healthy food bank eats! Contrary to what many actually know, YOU CAN eat healthy using food bank items. It's just knowing how to use the food and having recipes! Black beans either canned or dried are always included if not for other types of beans. Corn and flour tortillas - may be a day or two old but they are still good. Eggs are almost always given out - cheese and yogurt surprisingly is given out - usually past its SELL Date, it is still safe and good to eat! I found this recipe that I haven't tried yet and when I do I will let post again. It just made my mouth drool - what a awesome way to start the day with this type of breakfast tostada! Heck, you could even make this for a dinner for 2. Sometimes you do get a lot of cereal - this is a much better alternative for breakfast, regardless if you are using the healthier version or not.
" 98% less cholesterol • 79% less fat than the original recipe. These breakfast tostadas prove a healthy breakfast doesn’t have to be boring! 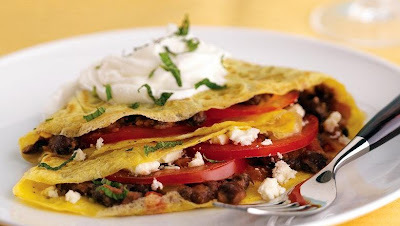 Greek yogurt lends creaminess to the dish while the black beans, tomato, cheese, and cilantro pack a big punch of Mexican flavor." I posted both the healthy and the original ingredients so you could choose what is best for you. Warm tortillas according to package directions. Meanwhile, in a small bowl use a potato masher or fork to slightly mash beans; set aside. In another small bowl or 1-cup glass measure combine eggs, milk, pepper, and salt. Beat with a wire whisk or rotary beater. Lightly coat an unheated medium nonstick skillet with nonstick cooking spray. Preheat over medium heat. Pour egg mixture into hot skillet. Cook, without stirring, until egg mixture begins to set. Run a spatula around edge of skillet, lifting egg mixture so that the uncooked portion flows underneath. Continue cooking about 2 minutes more or until egg mixture is cooked through but is still glossy and moist. Remove from heat. Spread one tortilla with mashed beans. Top with the remaining tortilla, cooked egg mixture, tomato, cheese, and snipped cilantro. Cut in half to serve. If desired, fold each portion in half. Top with yogurt and cilantro. *Note: When I make mine, I will be using eggs.